MIAMI (AP) — President Donald Trump emphatically rejected claims Wednesday that he was disrespectful to the grieving family of a slain soldier, as the firestorm he ignited over his assertions of empathy for American service members spread into a third contentious day. “I have proof,” he insisted. The controversy over how Trump has conducted one of the most sacred of presidential tasks generated new turmoil in the White House. After one slain soldier’s father accused the president of going back on a promise to send a check for $25,000, the White House said the money had been sent. Chief of staff John Kelly, a retired Marine general whose son was killed in Afghanistan, was left angry and frustrated at the way the issue has become politicized. The dispute was fresh evidence of Trump’s willingness to attack any critic and do battle over the most sensitive of matters — and critics’ readiness to find fault with his words. The aunt of an Army sergeant killed in Niger, who raised the soldier as her son, said Wednesday that Trump had shown “disrespect” to the soldier’s loved ones as he telephoned them to extend condolences as they drove to the Miami airport to receive his body. Sgt. La David Johnson was one of four American soldiers killed nearly two weeks ago; Trump called the families on Tuesday. 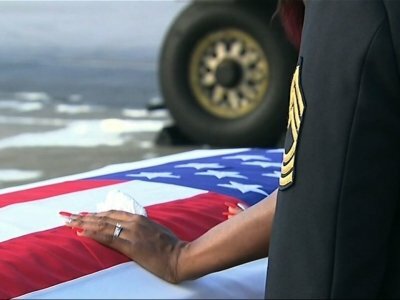 Rep. Frederica Wilson, a Florida Democrat who was in the car with Johnson’s family, said in an interview that Trump had told the widow that “you know that this could happen when you signed up for it ... but it still hurts.” He also referred to Johnson as “your guy,” Wilson said, which the congresswoman found insensitive. Cowanda Jones-Johnson, who raised the soldier from age 5 after his mother died, told The Associated Press on Wednesday that the Democratic congresswoman’s account was correct. “Yes the statement is true,” she said. “I was in the car and I heard the full conversation. Trump started the storm this week when he claimed that he alone of U.S. presidents had called the families of all slain soldiers. AP found relatives of four soldiers who died overseas during Trump’s presidency who said they never received calls from him. Relatives of three also said they did not get letters. Obama and George W. Bush — saddled with far more combat casualties than the roughly two dozen so far under Trump — did not call all those soldiers’ families, either, but both did take steps to write, call or meet bereaved military families. Chris Baldridge, the father of Army Cpl. Dillon Baldridge who was killed in June in Afghanistan, told The Washington Post that when Trump called him, he offered him $25,000 and said he would direct his staff to establish an online fundraiser for the family. But Baldridge said it didn’t happen. The White House said Wednesday that a check has been sent. And Trump spokeswoman Lindsay Walters said it was “disgusting” that the news media were casting his “generous and sincere gesture” in a negative light. White House press secretary Sarah Huckabee Sanders said protocol requires that the Pentagon and White House Military Office prepare and confirm an information packet before the president contacts grieving family members, a process that can take weeks. She said Trump has made some form of contact with every family for whom he has received the appropriate information. In private, he bitterly complained to associates about the flare-up, believing the press was eager to paint his response in a negative light, according to two people who recently spoke to him but were not authorized to comment publicly about private conversations. His anger was echoed from the White House briefing room podium by Sanders, who said she was “appalled” by what she described as Wilson’s efforts to politicize the tragedy. Wilson did not back down from her account. Like presidents before him, Trump has made personal contact with some families of the fallen but not all. What’s different is that Trump, alone among them, has suggested he’s done a better job of honoring the war dead and their families. He said Tuesday: “I think I’ve called every family of someone who’s died” while suggesting past presidents had not. Trump’s delay in publicly discussing the lives lost in Niger does not appear to be unusual, judging from past examples, but his comments are. He went so far Tuesday as to cite the death of Kelly’s son to question whether Obama had properly honored the war dead. Kelly was a Marine general under Obama when his Marine son Robert died in 2010. “You could ask General Kelly, did he get a call from Obama?” Trump said on Fox News radio. Sanders said Obama did not call Kelly but it was not clear if some other form of contact was made. She added that Kelly was “disgusted” the condolence calls had been politicized but said she was not certain if the chief of staff knew Trump was going to talk about his son publicly. Two White House officials said Kelly was also frustrated that the controversy had distracted from a significant military win over the Islamic State in Raqqa, Syria. Former Defense Secretary Chuck Hagel, who led the Pentagon for a portion of the time Kelly served as commander of U.S. Southern Command, was bitterly critical of Trump’s comments. Johnson was one of four soldiers killed in an ambush by dozens of Islamic extremists during a joint patrol by American and Niger forces, U.S. military officials say. Lemire reported from New York. Associated Press writers Curt Anderson and Josh Replogle in Miami and Robert Burns in Washington contributed to this report.